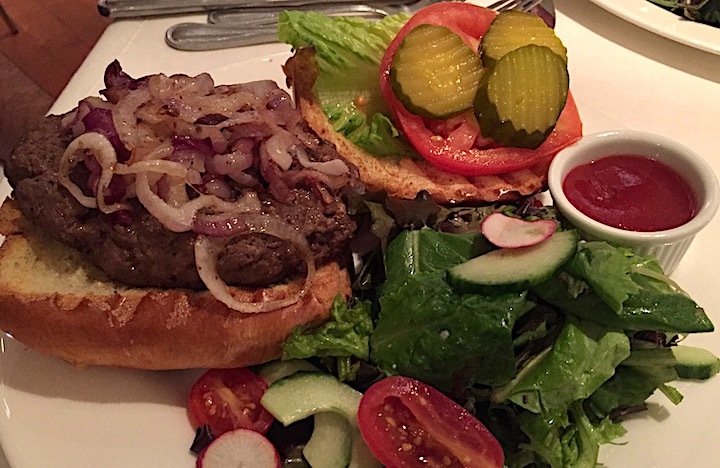 Even though I try to eat clean, healthy food most of the time, sometimes I just crave a big, juicy burger. When I do eat meat, I want it to be from a grass-fed, well raised animal. 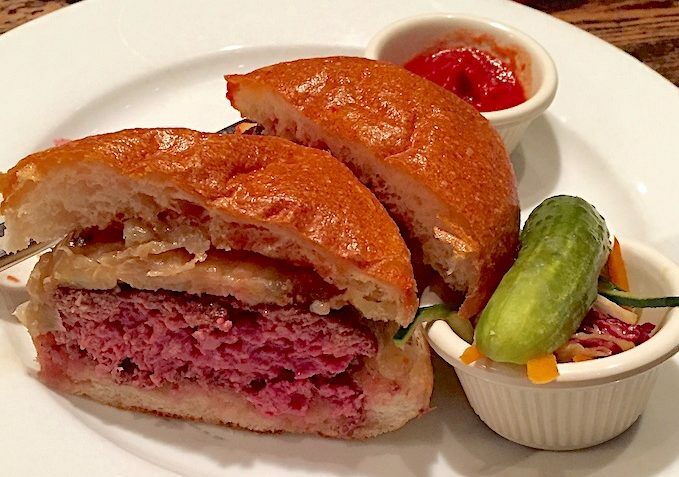 It used to be almost impossible to find a good grass-fed burger in Manhattan but that is changing quickly. There were plenty of good tasting burgers, always have been. 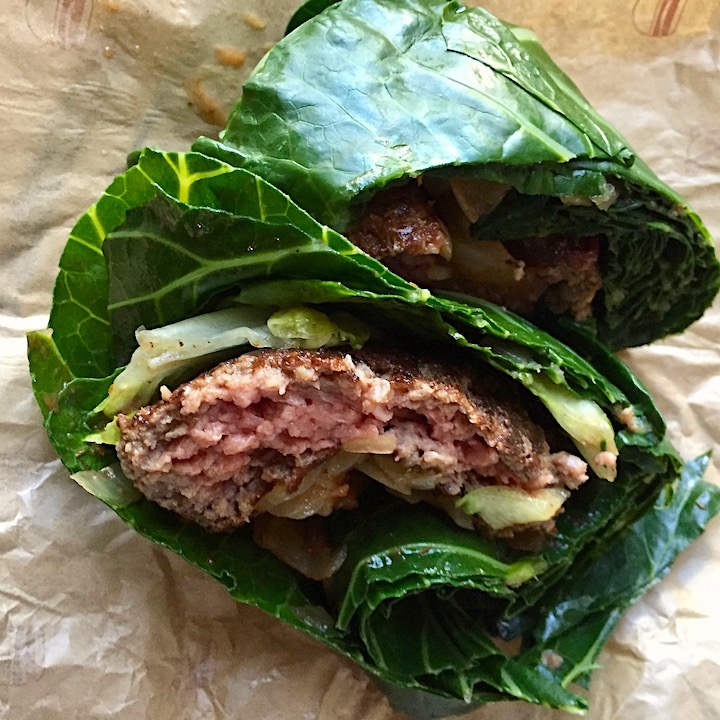 Now you can find great grass-fed in most neighborhoods, even in some chain restaurants (Bareburger and Umami Burger, for example). There are many reasons to choose grass-fed, including your health and the health and welfare of the animal supplying your meals. Cows are ruminants, which means they are constituted to eat grass, not grains. The fat they produce eating grass is different (and healthier) as is the quality of their lives than when eating grain, which causes them a lot of gas. Even if you don’t care about animal welfare, you might care about global warming (think about all that additional methane from grain-fed animals) or your own longevity, in which case, you would be choosing better (read completely grass-fed beef and eat it less frequently. It is lower in calories since it is leaner and it provides more omega 3 fatty acids – the kind we want. 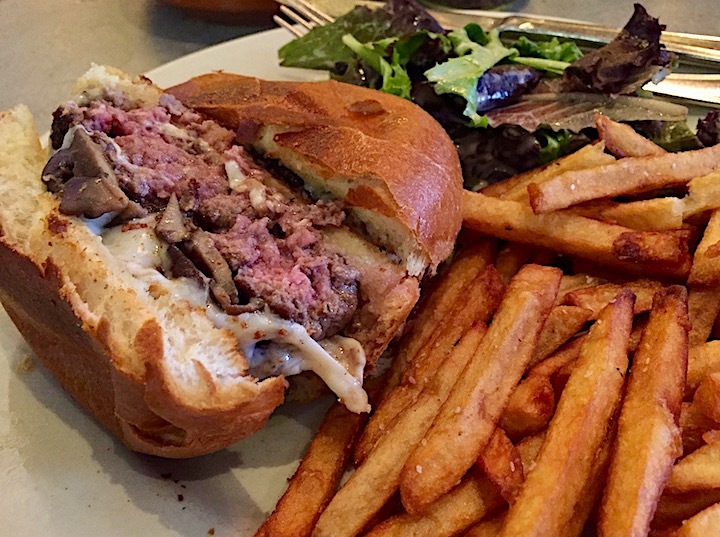 I’ve read that all the meat advertised as grass-fed may not be, so it is worth asking the restaurant or your server where you eat your burger where they get their beef. Organic, Wagyu and Angus don’t necessarily mean grass-fed and, in most cases, are not (organic refers to the quality of the feed, usually corn and Wagyu and Angus are types of cattle). Hopefully, disclosure in restaurants and markets will get more transparent as better grass-fed beef becomes more widely available. 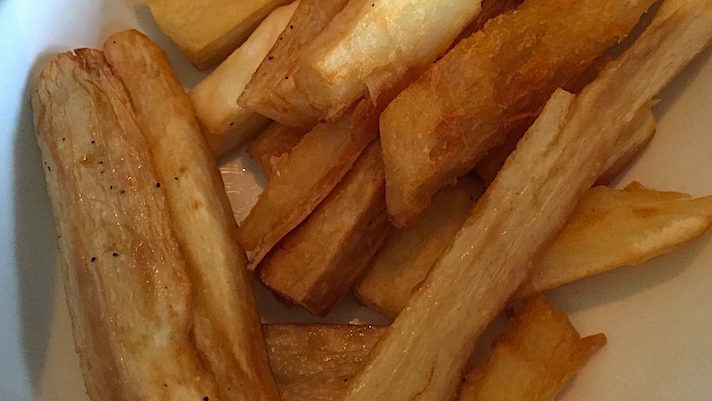 Okay – lecture over – now to the burgers. 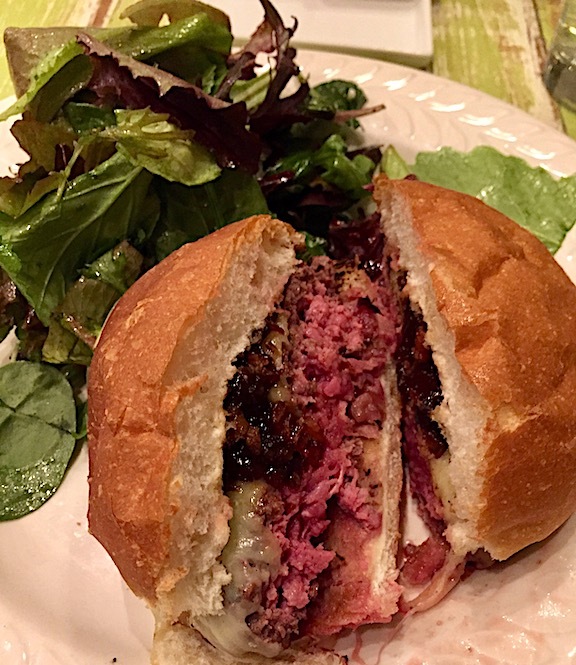 There are certainly many great grass-fed burgers I haven’t tried but these are the burgers I can recommend, including a few in other cities. 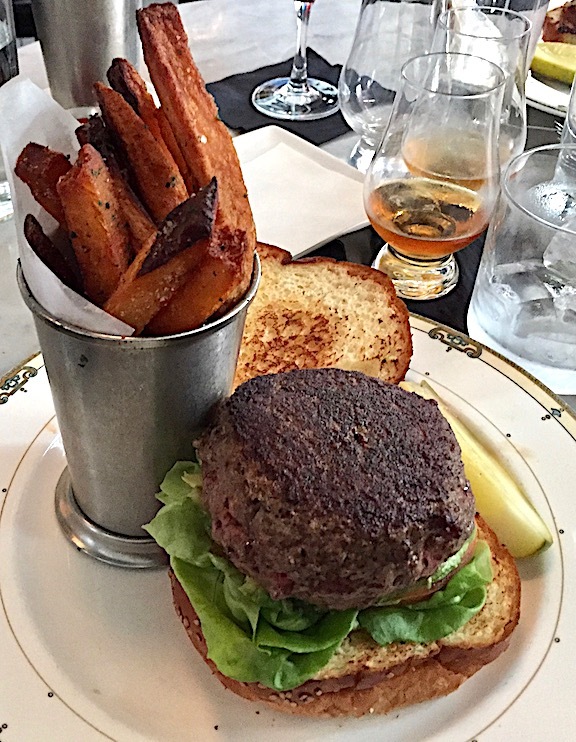 Many of these places also serve a good bison or veggie burger and often serve delicious French or sweet potato fries or a salad with the burger. I’ve found the best way to order (or cook) grass-fed meat is medium rare. If you overcook grass-fed beef, it tastes, well, too grassy. The most interesting article on food in The Times last week wasn’t in the food section (although Pete Wells’ pizza review was mouthwatering). Rather it was the piece on Food Halls in the business section that caught my attention. 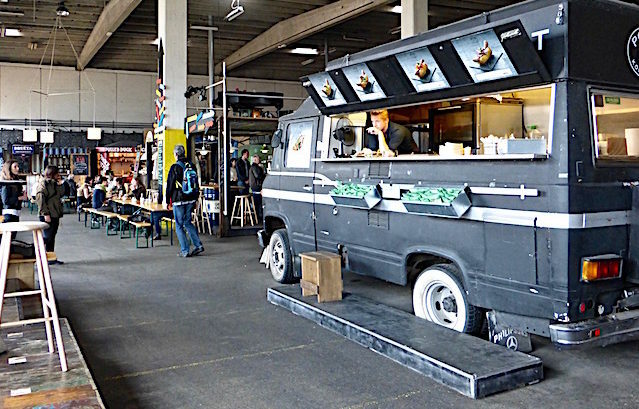 Food halls are growing in popularity and number and not only in New York. 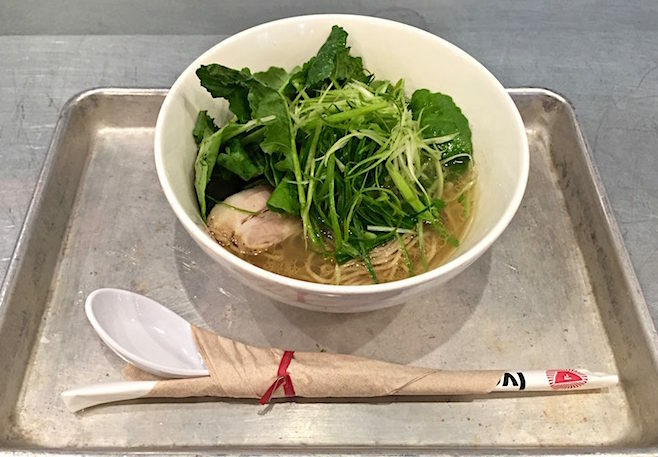 These markets are not the old fast food courts; the best of them bring together some of the tastiest and most accessible food offerings in our cities. Before the advent of chain grocery stores, most major cities had a central food market or hall, or several. But unlike European and Canadian cities with amazing, sometimes multi-floored market halls, we no longer have a traditional covered food market here. What seems to be a growing trend, however, is the newfangled covered food hall – a collection of food venders who are restaurant, food truck, or caterer based – providing creative selections of prepared foods and creating hubs of neighborhood hangouts and destination dining far beyond the offerings of a fast food court. Perhaps the first of these locations was the Chelsea Market, the repurposed former Nabisco factory which covers an entire block between 15th and 16th streets and 9th and 10th avenues. It was repurposed in the 1990’s to provide vendors enough space to house production and retail operations in the same place and included not just restaurants but also bakeries, grocers, a wine shop, importers and kitchenware. Today it has expanded to include coffee, clothing, a bookstore, delicious tacos, gelato and many smaller vendors. The public spaces include lots of communal seating areas which makes for easy picnicking whether alone or in a group. 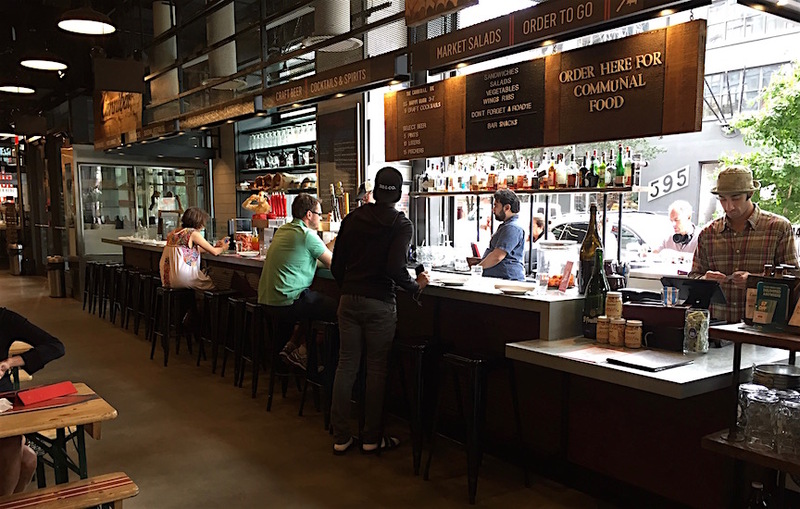 Gotham West Market (on 11th Avenue and 44th Street) with excellent ramen and tapas alongside salads and burgers. We recently saw neighborhood folks gathered there to drink/eat at the communal tables and watch the televised US Open. Turnstyle Underground Market (in the Columbus Circle subway concourse) made a useful, appealing and tasty (not to mention good smelling) dining destination out of a dank MTA passageway. Great for a quick bite in Midtown and handy for grabbing a gift on the run. 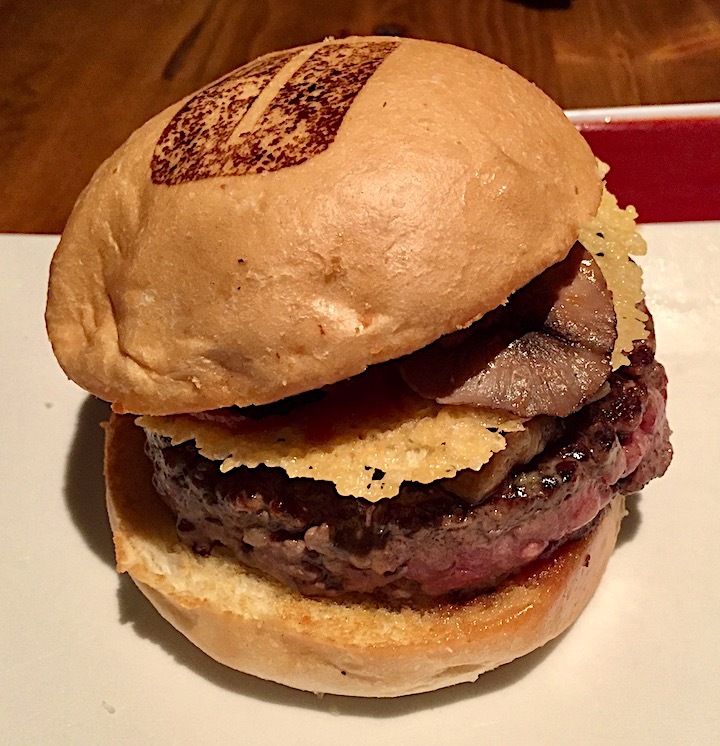 Hudson Eats (in Brookfield Place in the World Financial Center) which has a terrific 2 beers for the price of one happy hour at Tartinery and $3 draft beers at Northern Tiger as well as a broad offering of tasty food including Umami Burger. Plaza Food Hall (under the Plaza Hotel at 59th St and Fifth Avenue) where you can get a lobster roll or just a cup of coffee and a croissant. 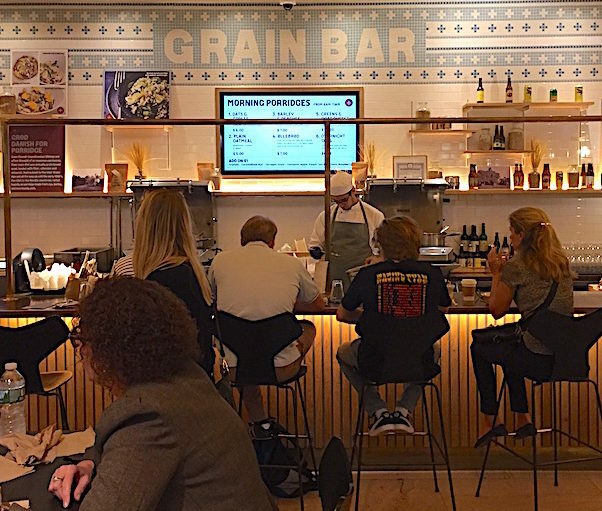 Great Northern Food Hall (in Grand Central Terminal) which is really one vendor with many types of offerings from coffee and pastry to sandwiches, a grain counter, liquor and a very upscale restaurant. See my review from last fall. Eataly NYC Flatiron, (23rd Street and Fifth Avenue) which is essentially a segmented grocery store with upscale Italian dining options at counters, restaurants and pizza but with a bakery, cafe, fish counter, food counters, liquor, kitchenware, pasta, cheese and meats plus one of the best produce markets in the city and delicious coffee that won’t break the bank. The Pennsy (33rd Street and 7th Avenue) Expensive but with some vegan options and a friendly bar in the rear if you need a decent spot to grab a bite or drink near Penn Station. 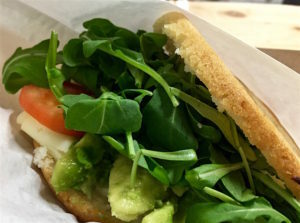 Gansevoort Market (14th Street near 9th Avenue) calls itself a rustic-industrial food hall since it moved from the actual old Gansevoort Market and has counters for crepes, pizza, empanadas and other snack type meals. 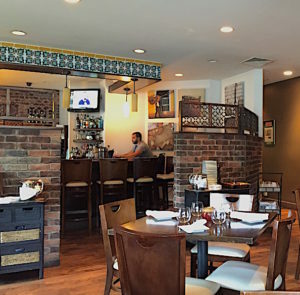 There is a pleasant spacious area in the back with tables and is far less crowded than the Chelsea market around the corner. Others I’ve read about that sound good but I haven’t tried yet include Urbanspace Vanderbilt (across the street from Grand Central), Industry City Food Hall (in the Industry City Complex in Sunset Park, Brooklyn), Dekalb Market Hall (Downtown Brooklyn) and Canal Street Market (Canal near Lafayette St.). 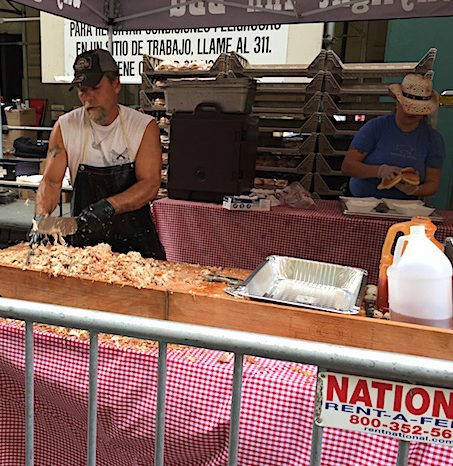 There is also Smorgasburg, that vast outdoor prepared food fest which lies somewhere between a food truck rally and a food hall. It been so successful that it now exists in 3 locations (Williamsburg, Prospect Park and Canal Street) around the city. 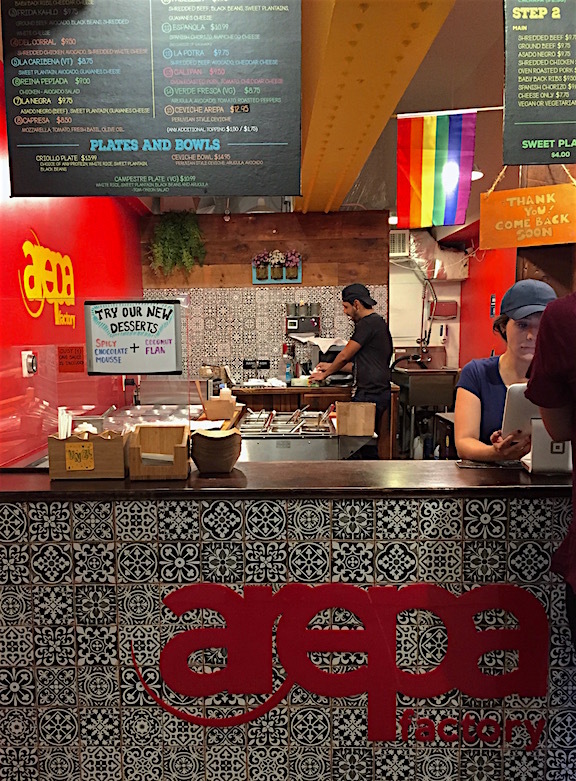 New York is not alone in the food hall explosion; There are terrific food halls in Copenhagen (Copenhagen Street Food), London (Spitalfields), San Francisco (the Ferry Building) and even Grand Rapids (Downtown Market) among many other cities. Sometimes it is a relief to have a place where you can roam around to see what you feel like eating instead of going to dine in a restaurant. You can eat quickly and informally at a counter or just get take out and plop down at a table. And not everyone in your group has to order from the same place. 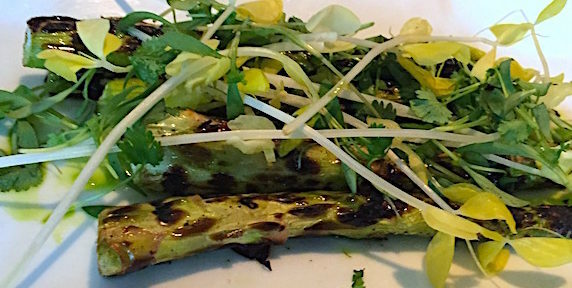 One person might have grilled octopus on mashed potatoes while another may prefer a bowl of ramen or salad. These halls are like a newfangled neighborhood, where people can hang out or take out, all under one roof, great for singles as well as couples or groups. And because they appear to be growing in popularity and to add value to gentrifying and developing urban areas, I think we will see many more soon. It used to be that if you were catching a train at Grand Central Station and needed something to eat, you could grab a bagel at Zaro’s, some nuts at Hudson News or hunker down for a meal at the Oyster Bar. In recent years, the lower level food court has been upgraded and improved but I wouldn’t eat there by choice. 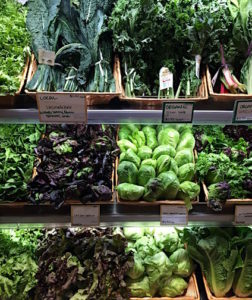 The high- end marketplace on the Lexington Avenue side of the station, anchored by Eli Zabar’s and including a nut shop, fish market, coffee shop, flowers, cheese and charcuterie is well stocked but it is quite pricey. I would buy bread or a gift there but nothing else really beckons to me. 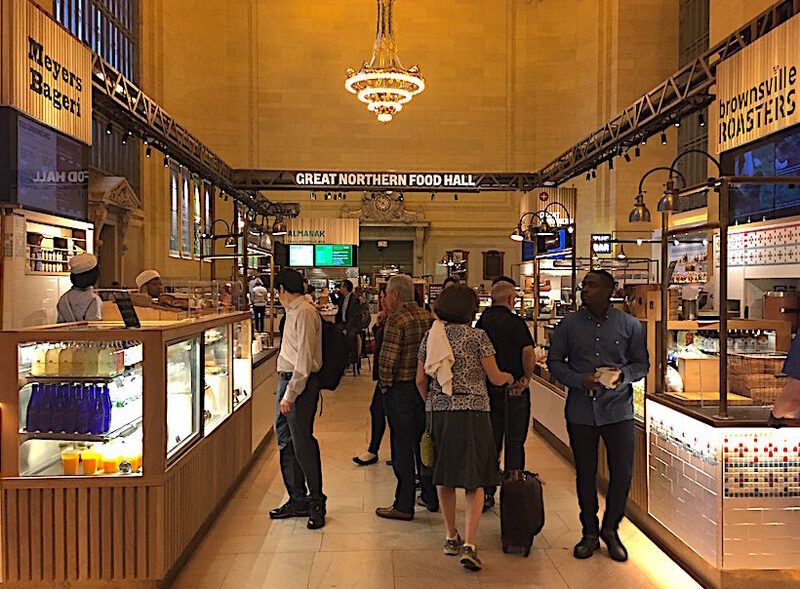 I’m happy to report there are new grab and go and dine-in options in Grand Central. 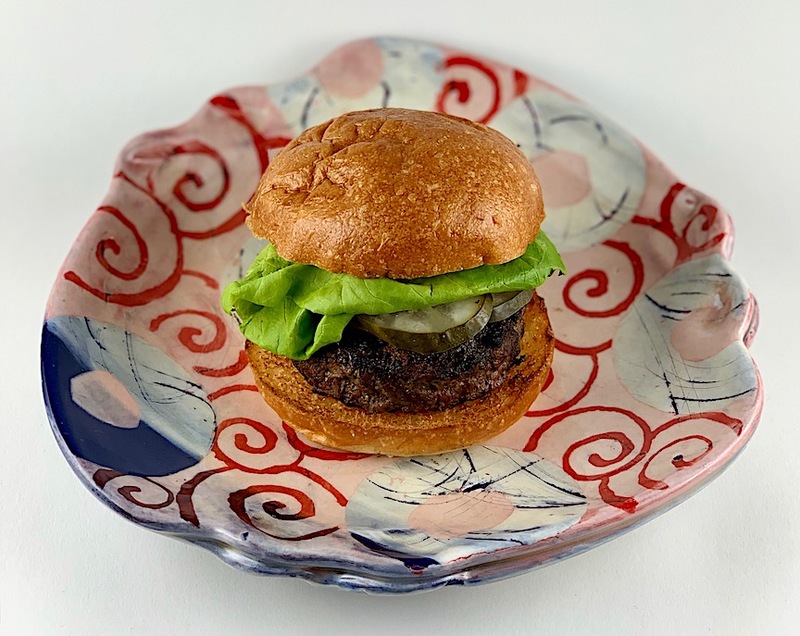 Claus Meyer, the Danish restaurateur who opened a chain of bakeries and Noma (voted best restaurant for several years running) in Copenhagen, recently turned his culinary talents to bringing Scandinavian food to New York. Starting with a pop-up patisserie, now brick and mortar, and a coffee roaster in Brooklyn, he has now tackled Manhattan. Lucky for us, he opened the Great Nordic Food Hall this summer in half of Vanderbilt Hall, the old Grand Central waiting room on 42nd Street, a bakery and deli near the IRT subway, a “hot dog” (really sausage) kiosk, and Agern, a high end restaurant focusing on local and seasonal food and drink, which I haven’t tried yet but hope to find an occasion to do so. 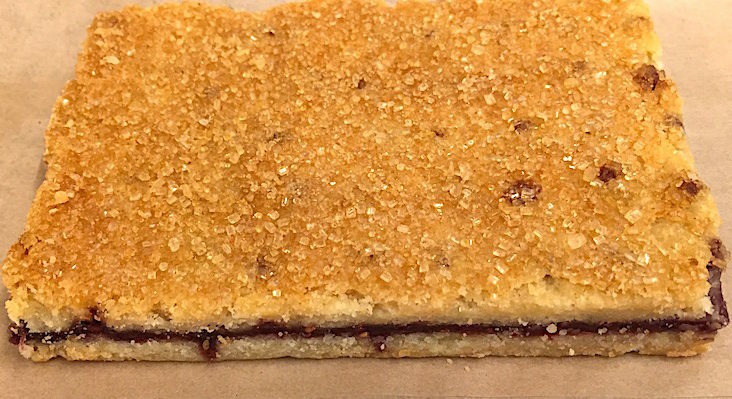 Since finding the Meyer Bageri (the bakery) at the Great Northern Deli, I have detoured whenever in the neighborhood or taking the train or the shuttle (just down the hall) to buy a sourdough or whole grain rye bread and, full disclosure, the raspberry bars – they are heavenly! Full of freshly made raspberry filling and sweet, buttery pastry, they are a reason to take the train. After sampling the delectable almond poppyseed twist and flaky, creamy maple pecan Danish, I didn’t dare try their gluten-free valrhona chocolate brownies but they look fantastic. The deli also sells sandwiches, drinks, bags of granola, cookbooks and gift items, in case you forgot a little something, either as a hostess gift or to eat while waiting for or riding a train. Next door to the deli is the diminutive but well designed and very tasty Danish Dogs. 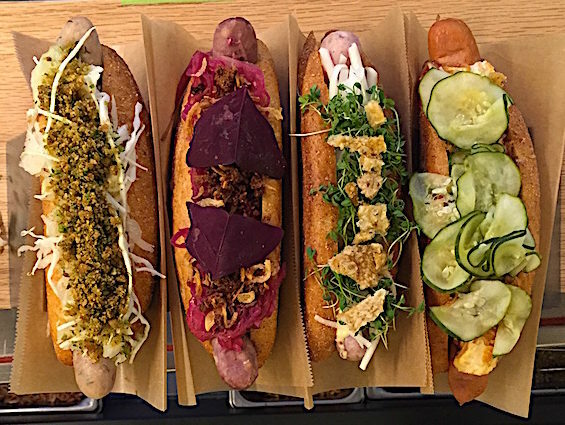 These are not traditional hot dogs but for $8 you have a choice of 4 kinds of sausage on an in-house made hot dog bun with abundant and interesting toppings including lingonberries, beet remoulade, cucumber salad, sorrel leaves and fried onions. Just remembering the delicious chicken sausage assemblage I ate there makes me want to return in a hurry! Until 10:30 every morning (when it is really too early to be seen eating a hot dog), this counter serves made to order $7 omelet sandwiches. 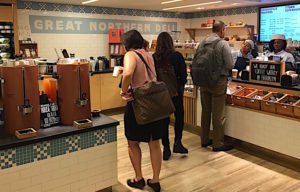 The food hall is appealingly spare, in neutral tones with a calm vibe (remarkable considering its setting) and includes a bar, coffee counter and kiosks for sandwiches (both open face Danish style smorrebrod and regular) and baked goods. There are plenty of tables for eating what you purchase as well as a sit-down, full service cafe for salads and hot food. 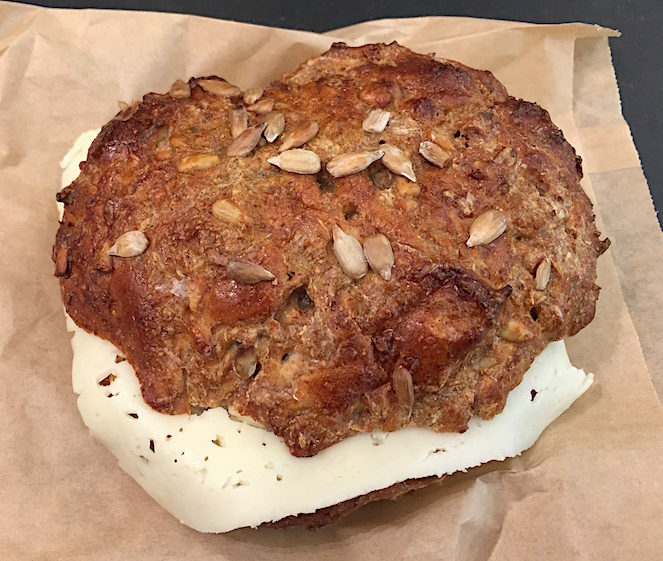 Over the summer, my husband and I tried several sandwiches, drinks and desserts – all were excellent, including the coffee (from Meyer’s Brownsville Roasters.) 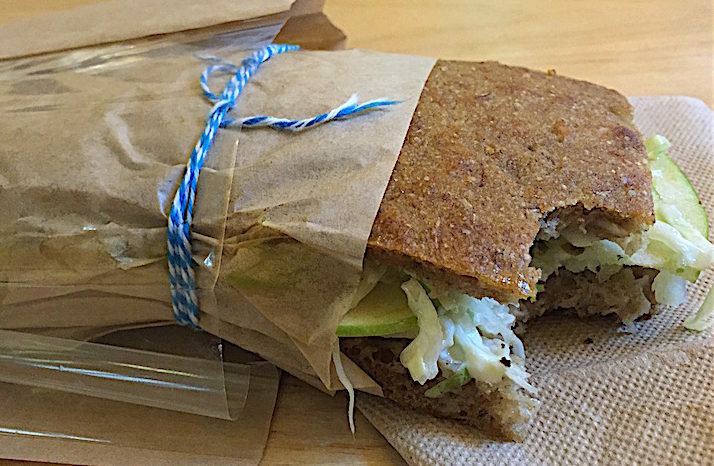 Our favorite was the celeriac sandwich (thinly sliced celery root, green apple and walnut ($10) on a flavorful in-house made whole grain “hoagie” and the above mentioned hindbaersnitte, the raspberry bar so good my mouth waters just thinking about it. The philosophy behind the food hall is as attractive as the food displays. The lowest paid employees start at the living wage of $15/hour with benefits – what other casual dining arena in New York can say that? Food is actually locally sourced and well raised, there is a feeling of quality over quantity, and although it is busy, the food hall is a pleasant place to sit and have a coffee, lunch or drink at the bar. It is not that the food is less expensive than what I could find in the downstairs food court. It’s just that it is so much more appealing on so many levels. 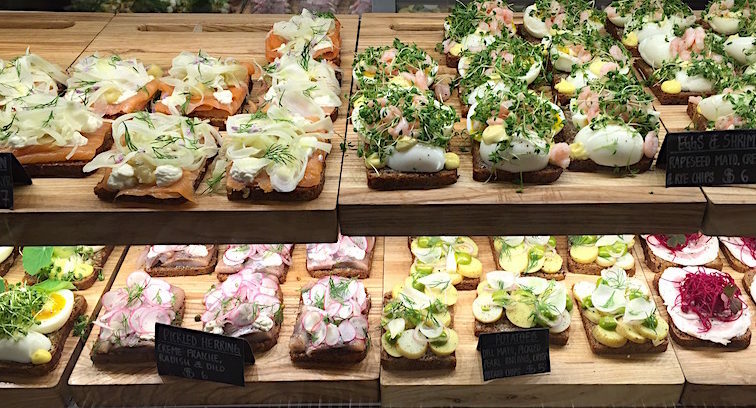 Instead of just grabbing the least “bad” thing I could find while running for a train, the Nordic Food Hall is a place at which I will plan to eat often and intentionally. 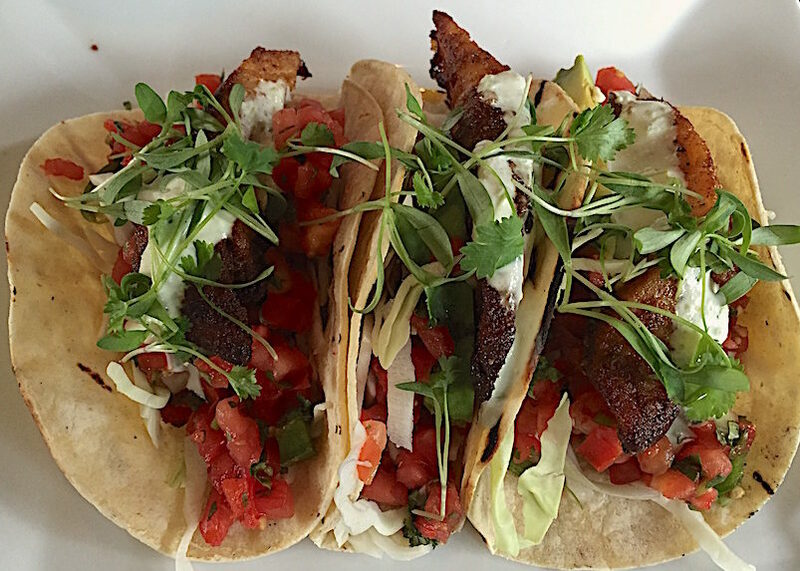 Finding a decent place to eat while driving on the highway is often a challenge. Recently, I met my mother for lunch in Danbury, Connecticut on a strip of road that one could find almost anywhere in the country running alongside an interstate. There were plenty of chain stores, gas stations and and I thought our choices for lunch would be between the local diner and a sub shop. Happily, I was wrong. 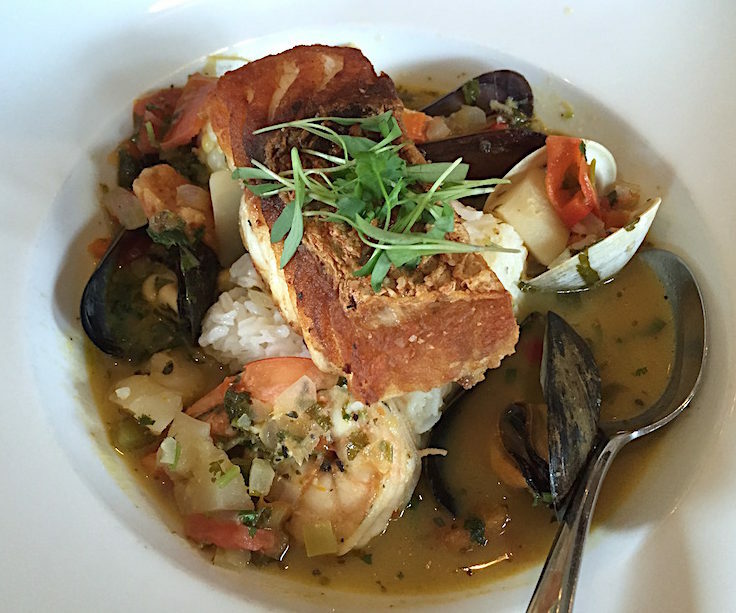 I am often leery of online reviews – you need to read them questioningly. This time a little research in advance proved rewarding. Yelp and TripAdvisor steered me to Mezón Tapas Bar & Restaurant, set back slightly from the hum of route 6 on one side and the roar of I-84 on the other. Inside there was music playing (which they very accommodating turned down when my mother asked them to) and plenty of space between tables. 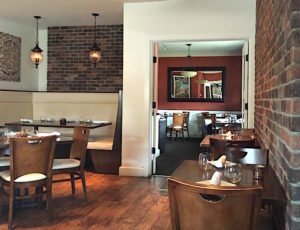 The restaurant is divided into 2 rooms, one with a bar and the other more of a dining room. Since it was lunch, we ate in the bar and watched it fill up quickly with locals. Our waitress was friendly and patient, explained the “Spanish/Latin/Caribbean fusion” menu, kept our water glasses full and even got the chef to write down the ingredients in a sauce Mom liked. Everything we tried was delicious. From the yucca fries ($5) and grilled asparagus ($5) to the fish tacos (3/$14) and seafood stew($14) with sea bass and rice, the food was well seasoned and flavorful without being over salted, my main complaint with most restaurants. We didn’t order them but the sandwiches looked appealing and there were many tapas, salad and meat choices, as well. Prices were quite reasonable for lunch and portions were generous. If you are heading north to see the changing leaves, to ski or for any other reason, remember Mezón. I’m happy to know a tasty place to stop off the highway and you will be, too. And for those of you who live too far afield for this specific information to be of any use, remember to do a little research before getting in the car. You, too, may be rewarded with a surprisingly pleasant meal en route. 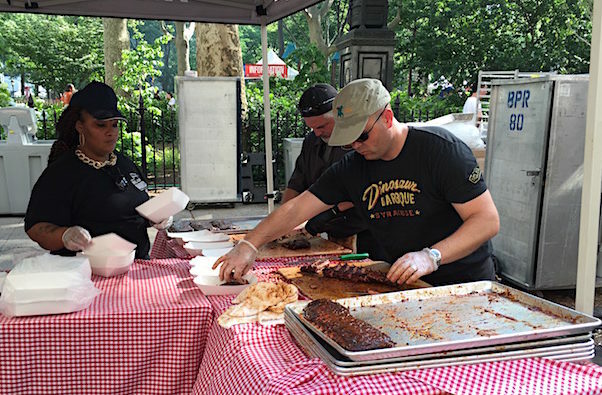 Barbecue isn’t something for which New York has always been known but that is changing. 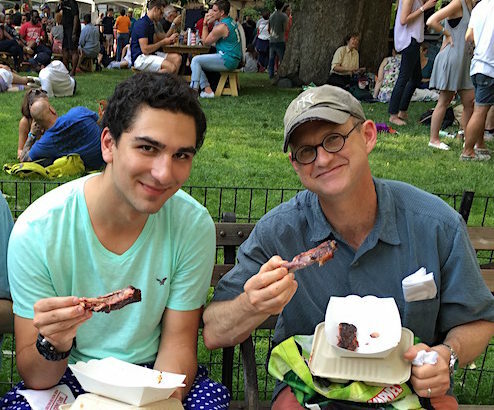 We now have several great barbecue restaurants dotted across the boroughs but the epic annual BBQ festival in and around Madison Square Park is where New Yorkers can really satisfy their cravings for smoked and grilled meat. 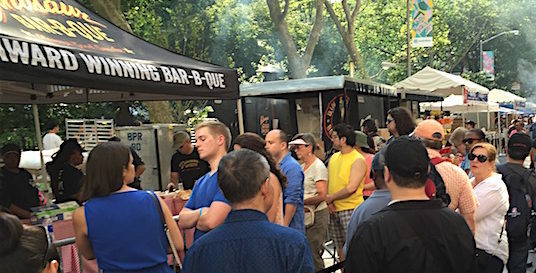 The Big Apple Barbecue Block Party took place last weekend and was so successful that when we arrived in the late afternoon, but almost 2 hours before the event ended, many venues were completely sold out of food. We were fortunate to get tastes of ribs and chopped, smoked pork from 3 of the more than the dozen participants who were cooking that day. 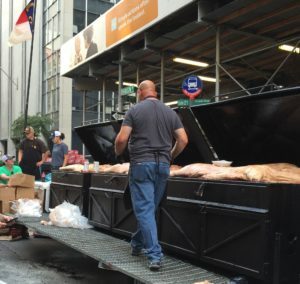 Pit masters from New York establishments were joined by those from Illinois and many southern states, providing us different styles of regional barbecue. There were beer tents and tastes from local bakeries along with some live music, both bluegrass and jazz. 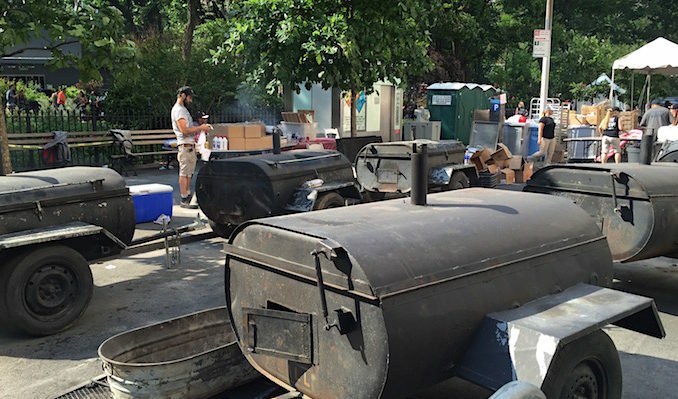 New York has lots of outdoor events during the summer months but this has to be one of the tastiest, plus it is a fundraising benefit for the park. Here are some photos to entice you to next year’s party.